A collection of works By Lily Nicholson. 1st to 28th of February, 2019, Newrybar Merchants, Newrybar. The series, “Wildflower”, has acted as a means of exploring concepts based around life, death and everything before, during and after. 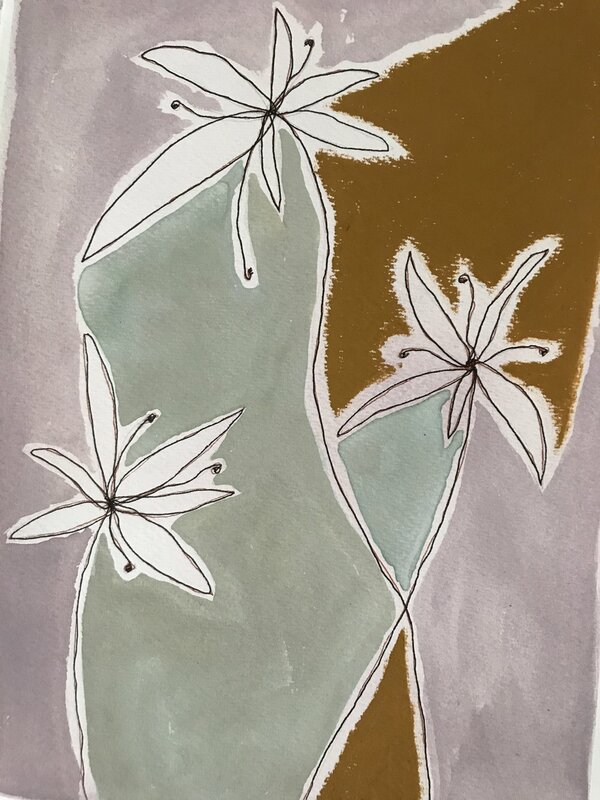 Referencing historically relevant colours and simplified floral forms is a means of understanding cycles of nature, and our connections to landscapes, particularly our presence in them during life, and perceived absence in death. “Pretty Nice (yeah good thanks)”, 2018. Acrylic, gouache, oil stick crayon, chalk pastel and pencil on canvas. 1010mm x 810mm framed in Tasmanian Oak. “Pretty Flowers (pretty angry)”, 2019. Acrylic, house paint, gouache, oil stick crayon, chalk pastel and pencil on canvas. 830mm x 630mm framed in Tasmanian Oak. “Flowers from Granny (sick, sad)”, 2018. Gouache, watercolour, oil stick crayon, pencil and pen on paper. 700mm x 520mm framed in Tasmanian Oak. “Among the Wildflowers (in a boat out at sea)”, 2019. Gouache, oil stick crayon, pencil and pen on paper. 520mm x 420mm framed in Tasmanian Oak. “Hitched a Ride with the Wind”, 2019.